Cocoa liquor (also known as Cocoa mass) is the basic ingredient in manufacture of all chocolate. 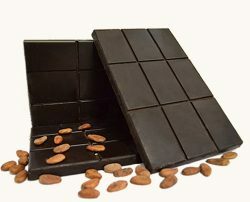 It is the first product in liquid form which comes from pressing of the cocoa nibs. Cocoa liquor is the source of both Cocoa butter and Cocoa powder. After fermentation, cocoa beans goes under high heating process, by means of a Micronizer, which causes the shell to be separated from the nib. Thereafter the cocoa beans are broken and a winnowing machine is used to remove the shell thus collecting only the cocoa nibs. After roasting, the nibs are ground and processed into cocoa liquor.